Nothing says “Love” like a dozen roses…so I thought I would give them to you this Valentine’s day in the form of a pattern…and also a video on how to paint them. 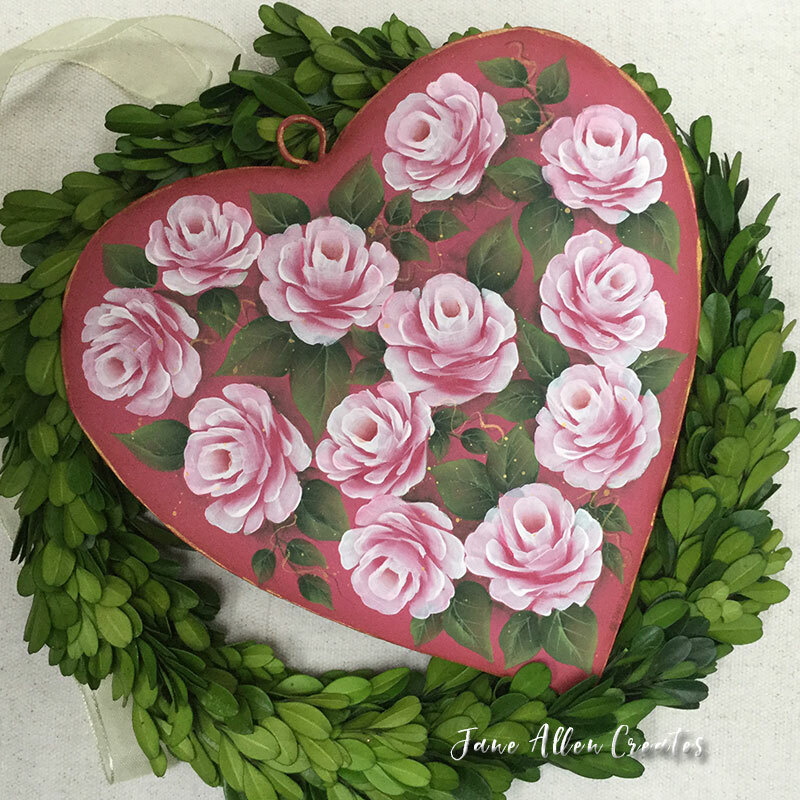 The roses were painted on an eight inch tin heart from Della and Company. I love how it looks on the tin heart but you could put it on any surface. You can paint these roses in any color. You just need a lighter color and a darker color. You will want to make sure there is enough contrast between the two colors. It is also good to use more opaque colors especially for the lighter color. I prepped my tin by sanding with medium grit sand paper, and then wiping off the dust with a paper towel. I sprayed with a coat of auto body primer. I like to use Pep Boys white, but any brand and color will be fine. I then use DecoArt’s Adhesion Medium with the first coat of paint. I used DecoArt products for this project. The heart was basecoated with Razzle Berry. The leaves were basecoated with Hauser Medium Green, the back of each leaf and center vein shadow was floated with Evergreen. The leaves were highlighted with Hauser Light Green next to vein shadow and on opposite outside edge of each leaf. The veins were painted with a brush mix of Warm White + Hauser Light Green. The roses were painted with Warm White as the light color and Razzle Berry as the dark color. The following video will show you how to paint the roses. Because the base color is the same as the dark color of the rose you do not have to do the first step. Please do not feel discouraged if your roses don’t turn out perfect the first time. Practice makes perfect. The first rose I painted was with Pricilla Hauser. She told us you needed to paint 100 roses to paint a perfect one. I think these should go a little quicker for you. I have not painted roses for a while and had to do a little practice before making the video. The outside edge of the heart was shaded with Deep Burgundy. The edge, tendrils and flyspecking was done with Emperor’s Gold. Here is a worksheet of the steps to create the rose. This rose was painted in Raw Sienna and Buttermilk. These roses were painted with a 1/2″ angel shader. This heart looks nice on its own, but would also look lovely in a wreath. I hope you enjoy painting this project. Thank you Charlotte, it has been a while for me too, I use to do a lot of florals. Thank you for your rose lesson. I love roses, and hope to learn how to paint them one day. Thank you very much for the rose demo!! You are welcome Barb, enjoy! of roses in video and pattern! Can’t wait to try! You make it look easy! Happy Valentine’s Day!!! Thank you so much Jane! And these roses don’t have to be watered and stay beautiful forever! What a sweet gift. Happy Valentine’s Day. You are very welcome Tina, enjoy! Thank you, Jane. This is beautiful. Can’t wait to play with the roses in different colors! Beautiful Jane! It’s been a long time since I have painted roses! Thanks for the “refresher” course! You are welcome Lynn, the same is true for me. Thank you Effie, I hope you are inspired.